For its final exhibition at the Palais de Rumine before the move to Plateforme 10 (the modern urban art district, presently being created next to the station in Lausanne), the Musée Cantonal des Beaux-Arts has chosen to go out with a bang! Not only is it showing recent and monumental creations by one of the most influential artists of our times, but Ai Weiwei’s art has not been confined to the museum’s own exhibition rooms this time. Weiwei’s pieces have invaded the lobby, as well as the archaeology, history, zoology and geology museums also housed in the building. It’s a treasure hunt of an exhibition and a great excuse for an afternoon of discovery. 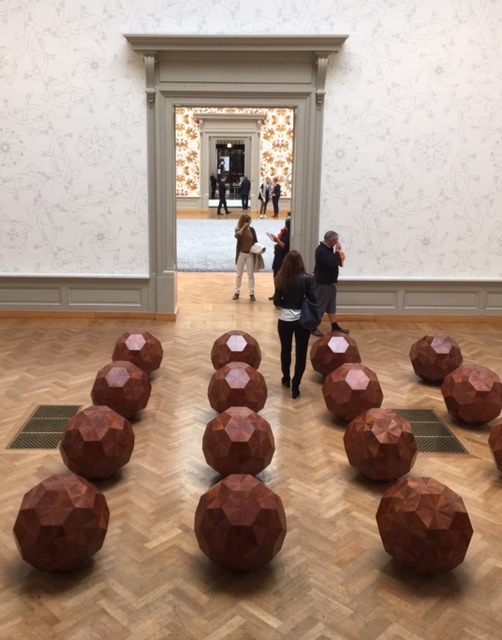 The central exhibition brings together more than 40 pieces: works in wood, porcelain, marble, jade, crystal, bamboo, and silk, including wallpapers designed by the artist, photographs and videos, showing the rich variety of Ai Weiwei’s work and his profound knowledge of Chinese cultural heritage. In his ingenious and playful way, the activist artist is translating traditional motifs, methods, and materials into critique, overtly or covertly, of the Chinese political system. Other pieces reflect on other troubling topics of our times such as economic dependency or the worldwide refugee crisis. As the messages of his works of art are neither obvious nor immediately recognisable in most cases, visitors should make sure to pick up the accompanying brochure at the reception (an audio guide is not available). It will help to decipher the metaphors and to detect Ai Weiwei’s pieces ‘hidden’ among the other exhibits in the different museums. The brochure also helps to make sure that important details don’t go overlooked. For example, in the monumental decorative wallpaper designed by the artist, which, at first glance appears to be decorative, but at second glance turns out to be a complex kaleidoscopic fusion of the Twitter logo, surveillance cameras, chains and handcuffs (allusions to the 81 days of imprisonment of the artist by the Chinese authorities in 2011). Upon even closer inspection, the golden symbols hide nudes and the face of the artist in its reflections. The piece ‘Sunflower Seeds’ shown in Lausanne is a smaller version of the gigantic installation Ai Weiwei designed for the Tate Modern in London in 2010 where he covered the floor of the Turbine Hall with 100 million sunflower seeds: each seed hand-painted, the work of 1500 artisans of the former imperial workshops in China. Even if the seeds look all the same, each and every one is unique, like every individual in society. It is impressive to imagine, that the 100 million seeds are still ten times less than the total population in China. Devoting unimaginable patience, time and energy (it took the 1500 artisans two and a half years to complete the task), Ai Weiwei brings into focus the significance of individuality, but also the imposing strength of individuals gathering together. At the opposite pole of ‘made in China’ mass production, the piece also alludes to globalisation and the social realities of production chains, catering to western consumerism with cheap labor and horrifying working conditions. 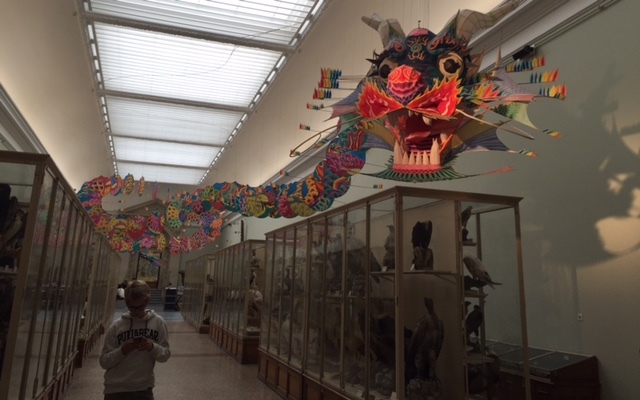 Many of Ai Weiwei’s creations, whether made of porcelain, wood or bamboo and silk, are demonstrations old, traditional techniques and art forms (like Chinese kite making) with a contemporary twist. 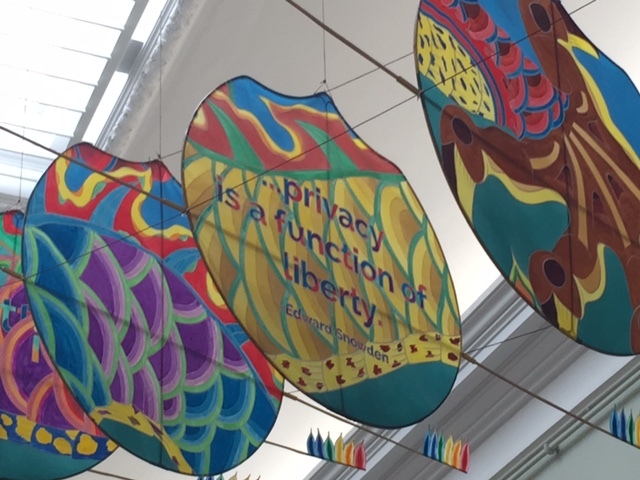 A perfect example is a piece called ‘With Wind’; a colourful dragon, taking flight in the zoology museum: each of the individual kites making up the dragon’s body carries quotations from international activists (either imprisoned or forced into exile), among them Nelson Mandela, Edward Snowdon and naturally Ai Weiwei. ‘With Wind’ has only been shown once before and was designed for an exhibition in a disused warehouse, formerly serving as a workshop for inmates of the infamous prison of Alcatraz in San Francisco. It thus becomes a powerful symbol of personal freedom. The majestic marble fountain on the staircase of the Palais Rumine hosts another of Ai Weiwei’s masterpieces, blending in so nicely that it could be easily overlooked: a buoy made of marble is ‘floating’ in the water, the material a contradiction with the airiness and fragility we associate with the silhouette. While shooting his documentary ‘The Human Flow’, the artist spent considerable time on the Greek island of Lesbos, getting a front-row view of the tragic realities of the Mediterranean refugee situation. Choice of marble for the symbol of the life-buoy not only highlights the danger of the crossing, it preserves the object forever and transforms it into a monument to the tragedy of the refugees. 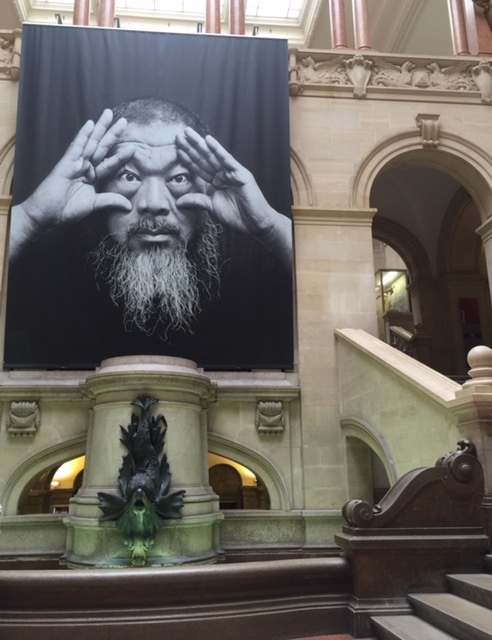 The exhibition at the Palais Rumine is a more than worthy farewell to the old location of the Musée Cantonal des Beaux-Arts and an out of the ordinary tribute to the probably most remarkable visual artist of our times. And the best of all: it is for free!